Found in Java, Borneo, Sumatra, Sulawesi, Moluccas, Laos? and the Philippines as a medium-sized, hot to warm growing terrestrial at elevations around 300 to 1200 meters in lowland and mixed montane rainforests in deep shade in alluvial soils with sandstone, limestone and shales in dense shade. The leaf is cylindrical, several noded pseudobulbs carrying a single, apical, erect, elliptic to ovate, acuminate, longly petiolate leaf that blooms in the summer on an erect, laerally from the nodes on the lower part of the pseudobulb. The flower laxly few to many flowered, 18" [50 cm] long, pubescent, racemose, terete inflorescence with acuminate, lanceoelate bracts and successively opening. lowland and hill forests at elevations of 400 to 1200 meters. 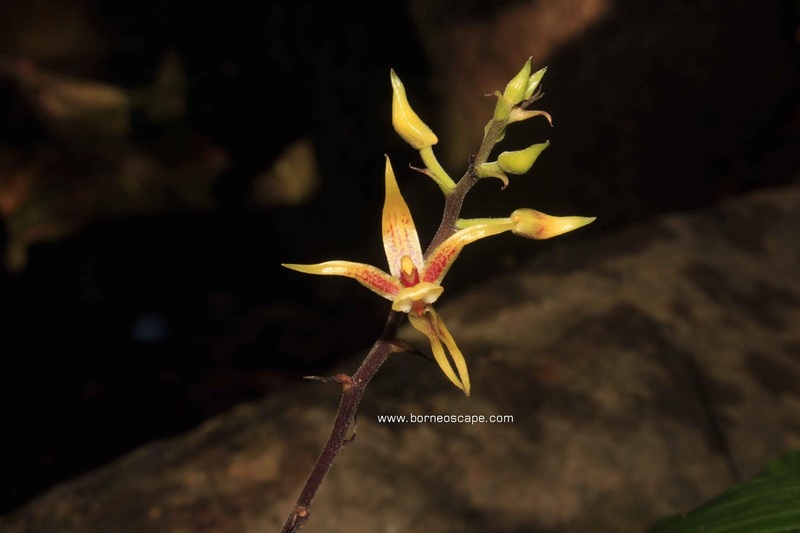 The correct name for this species is most likely Plocoglottis plicata [Roxb.] Ormerod 2002 because Limodorum plicata Roxb was described in 1832 and is the basionym for P plicata beating out P acuminata by 17 years.